Livin is Easy in Easley! 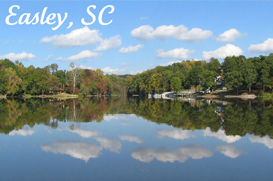 Easley is just minutes to the west of Greenville, SC, and is considered a principal city in the Greenville/Pickens/Anderson County circle which make up the Upstate of South Carolina. It is named after Confederate General William King Easley who rallied for the Charlotte to Atlanta Railroad in the late 1800’s. Easley is now home to the Big League World Series, the Upper South Carolina State Fair and the weekend destination of choice for car racing fans at the Greenville-Pickens Speedway. The area is a diverse and thriving culture of country to city, historic homes to sprawling farmland. The area consists of the mini towns of Pickens, Liberty, and Powdersville and has grown exponentially in the past years. The schools, hospital system and businesses are surrounded by new construction communities at extremely affordable prices yet still offer large lots for privacy and space. Clemson University is located on the far western edge of Pickens County and is considered part of Easley. And in this city during football season, Easley in particular is covered with orange tiger paws and banners. This city is proud of it’s community and especially it’s university. The university is also home to training for all aspects of our country’s military and the pride in our armed forces is evident in this growing community. Easley is a wonderful and growing town that offers amazing opportunity for affordable housing. Historic and heartfelt, Easley is a wonderful place to call home. Just don’t forget your Clemson Tiger Flag on the front porch!